I am going to go out on a limb and say chocolate covered anything makes the world a better place. Pretzels? Yes please! Strawberries? Without a doubt! S’mores? I’ll take two! So, when I saw this recipe on How Sweet It Is I knew it was a must. 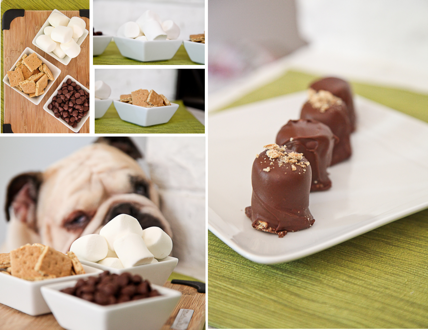 Not only is it a new take on s’mores (ahem…almost bite-sized and covered in chocolate) but also, they are amazingly simple and turn out super cute! Perfect for anything from an afternoon snack for the little ones to an impressive little dessert at a dinner party, these tasty bites require only three ingredients and can be embellished however you’d like! Break graham crackers into fourths and snap each fourth in half so you have a bunch of small graham cracker squares. Melt a small portion of chocolate to use as “glue”. Put a dab of the melted chocolate on each square, this will act as glue for the cracker and the marshmallow to stick together. Press a marshmallow down onto each of the squares that you just dabbed. Place in the fridge for about 15 minutes or until the grahams and marshmallows are stuck together. Using a thin fork or a skewer, (or your fingers if you don’t mind a little chocolate on your hands) dip the marshmallow/graham in the chocolate and cover as much as you can. Remove and let set on wax paper, while they are setting embellish with anything! More chocolate, graham cracker crumbs, candy, whatever you like! Let them set at room temperature or if you would like them to set faster put them back in the fridge until they have a lovely, hardened chocolatey shell! Store them in the fridge or at room temperature!